Lambing started on 10th April and for my ewes; today April 30th it was all over, the last lamb was born just after lunch. You can tell when a ewe is thinking of giving birth, she moves away from the flock to somewhere sheltered and quiet, then lies down and the big push begins. I wasn't quick enough with the camera, one minute she was lying down and straining, the next she was on her feet and the lamb flopped out. Straight away the lamb was being licked clean and was up on its feet within five minutes..There was still one more job to do. The lamb's navel is an open wound until it dries up so once mother and lamb are well bonded the lamb gets a squirt of iodine on its navel and my blue mark on its shoulder. Thats it, lambing over for another year, I'll hang up the lambing bag and have a lie in tomorrow. There are more births to come duck eggs under a broody hen and in the incubator. The byre finished at last.......well almost. The outside is finished, now I have to complete the interior but that's another story. The images are in chronological order. I should add that the project was completed with the skilled help of Jamie Santus (Joiner, Achosnich) I did the labouring and unskilled stuff. 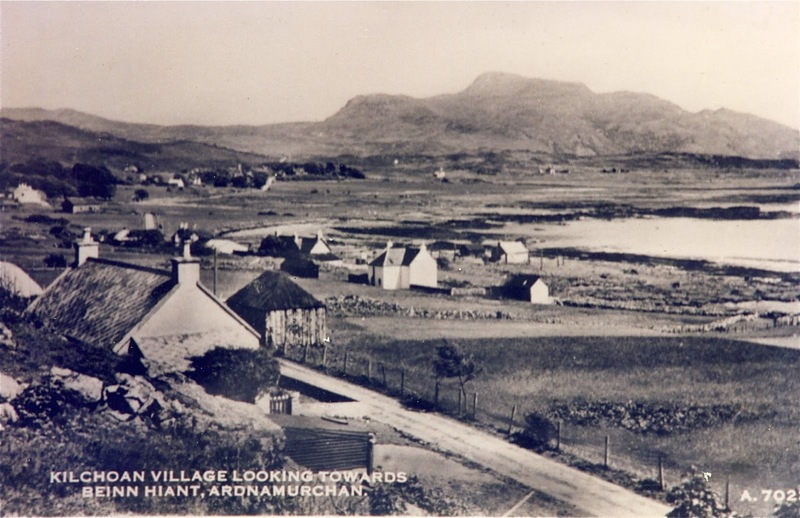 This postcard of the village of Kilchoan was probably made in the late 1940s. 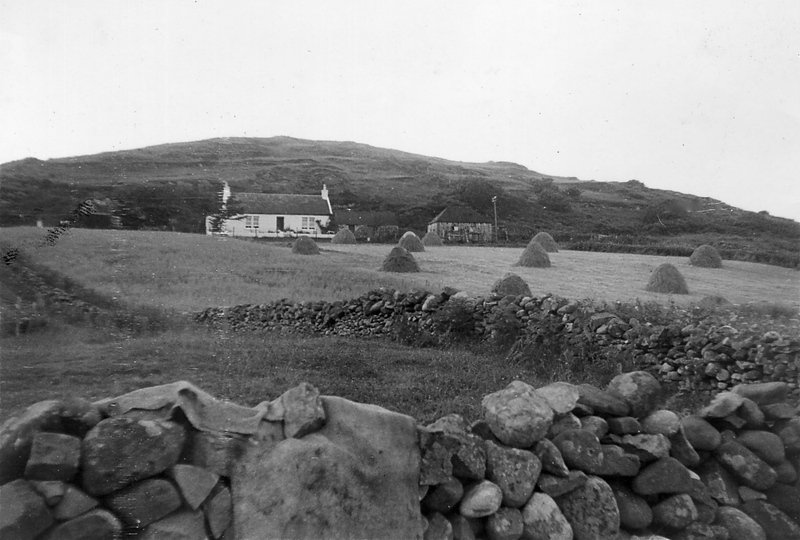 The byre is just below the house on and the right. The walls are clad with wood, the roof consists of sarking covered with roofing felt.My neighbour Alistair Cameron thinks that the byre was built in the early 1930s. Taken in the 1950s by Alistair this shows Craigard and the byre probably in July/August (haymaking). The byre was still substantially the same as in the 1940s and housed two cows and their calves in winter.The house has since had dormer windows added and a large kitchen on the west end of the house. No "Hydro"poles for electricity; oil lamps and generators were the only source of lighting. September 2010 the byre before the Dec 2011 gale removed the roofing felt. Walls were clad with "wriggly tin" or rusty, holey corrugated iron after rain the interior was soaking and the wooden structure in danger of rotting. Doodles are my working out of the materials needed. It was the December gale that motivated me to get on with the job. Jamie fixing the re-cycled box profile roofing sheets that were originally on the Sonachan Hotel laundry. We added dwangs (purlins) inside to fix the sheets to through the remaining felt and sarking. We gradually replaced the rusty, holey wriggly tin with boarding. Because of the power of the wind here we didn't want to leave the building completely open. The cedar boards were harvested from the road widening site at Drynie Hill, milled by Sandy MacDonald at Ardslignish. The cedar trees themselves were planted for Queen Victoria's Jubilee. The west end of the south wall was slightly put of true, about ten degrees so once the two long walls were boarded we removed the west wall and rebuilt it as near perpendicular as possible. Roof propped up and west wall removed. West wall complete but we did manage to construct an optical illusion......it all seems perpendicular if you drive or walk quickly past it. Once the creosote and tar are on the illusion will be complete. Doing the foundation last.....the stone base had been eroded and the floor undermined over the years. The solution was a dry stone wall and buttress ( well almost dry, we used some concrete). 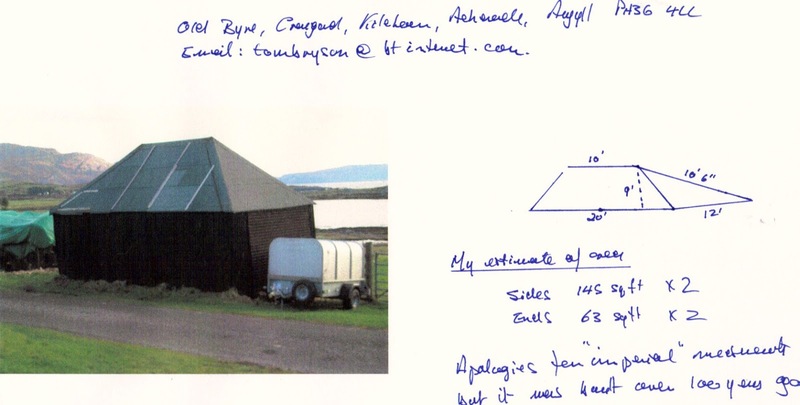 The quality of the walling is supposed to distract you from the lack of perpendicularity of the byre wall. I will replace this pic after I have cleared the tools and debris away. April 24th and almost finished....only one more coat of bitumen paint to go on. Finally ........this is one of the future occupants, the Toggenburg kid "Acorn". She is just over a month old but won't arrive until September. The new generation of battery cages on commercial farms do give hens more space and nest to lay their eggs in but one thing they cannot do is provide a dust bath. This is a vital social activity. It's a chance to get rid of ecto-parasites by scratching dust and soil up into the plumage and shuffling it around. There is nothing they enjoy more on a warm sunny day. Animal behaviorists call it "comfort behaviour" one of those natural activities essential to animal welfare. In this case they destroy the flower bed at the same time. Each day we bring ewes and lambs down from the hill to better pasture. Basically you treat them like dairy cows for a couple of weeks, good grass and some concentrates to support milk production, especially if they have two lambs. There is a drawback because there is more natural shelter in the hill park. When I went round the ewes and lambs yesterday morning one lamb was missing, the one on the right in the image above. My first thought was it had fallen in the burn then that a fox had taken it. I eventually found it curled up in a hollow very cold and wet from the frost. It had the same therapy as the last one, glucose then warmth, then milk via stomach tube and eventually milk from the bottle. But ewes don't have brilliant memories and after a while they can forget about the one that has been in care so we set up a pen in the byre, the lamb is back with Mum and protected from wind and rain until its stronger. However, being closer to a wild animal than a farm animal Blackface ewes rarely cooperate. This one had to be caught and steered to the byre using its handlebars. She hadn't forgotten so a happy ending in that I don't have to bottle feed it for the next eight weeks. 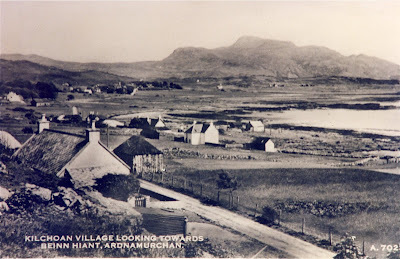 Unfortunately the Editor of the Kilchoan Diary was passing at the time. Old books on farming topics are a mine of practical information and an insight into how things were done 70 or 80 years ago. It was this book by Reginald Appleyard (remember him?......he was the breeder of the original Ixworth fowl) that told me what to do with spraddle legged goslings. He gives instructions for hatching geese under broody hens, five eggs per hen .....and this was commercial production!. 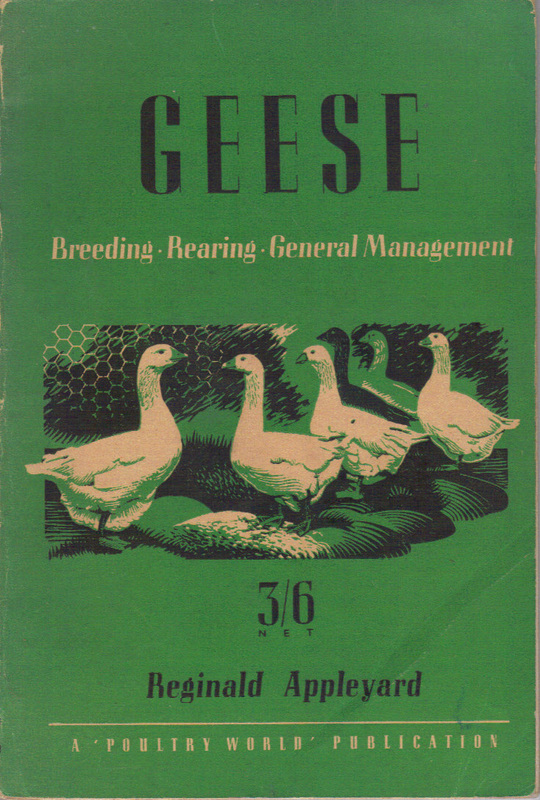 "Michaelmas Geese" or "Green geese" were killed in September/October after a summer fattening on grass. "Christmas Geese" were a different matter, they needed extra labour and expense for food, skimmed milk, buttermilk even turnips were used as fattening rations. This produced an 18 lb (7kg) carcass. Ours will be green geese, killed, plucked and cleaned and into the freezer in September for Christmas eating. I don't know what we'd do with a 7kg goose. These, "how to do it" books were often produced by trade magazines, "Poultry World" as in this case. 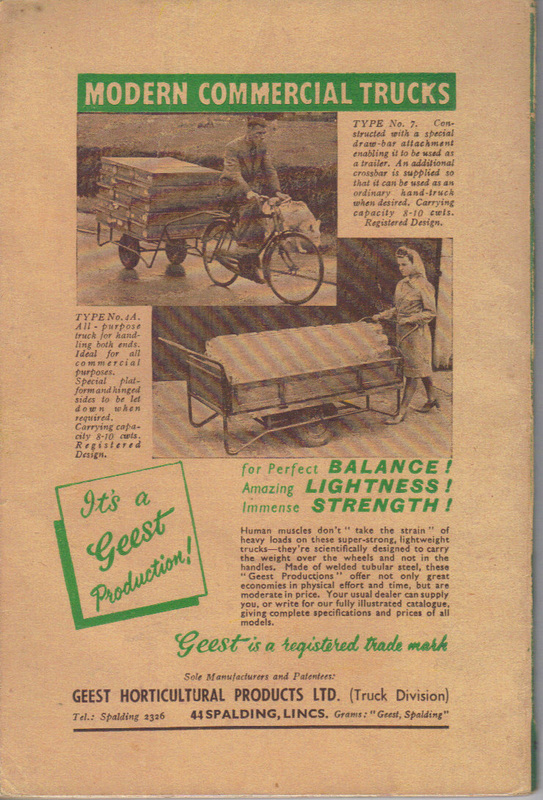 The cost was defrayed by including adverts like the one below. Poultry World still is the industry trade paper. 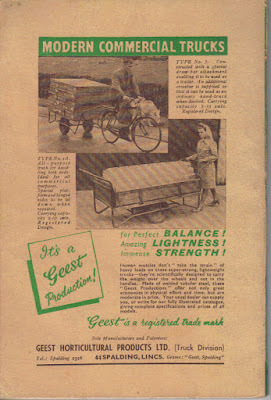 In the 1940s people presumably saw bicycle powered farm transport as normal together with huge wheelbarrows for ladies. Its a long way from Adam Henson's JCB four wheel drive farm buggy..... and control of poultry production by multi-national corporations. One surprise is that he doesn't seem concerned about predation of free range geese kept outdoors without housing, but it would take an unusual fox to tackle an adult gander. I'm not so sure about pine martens though. For those born after 1970, 3/6d ( three shillings and sixpence) is 17 pence, well actually seventeen and a half pence but I don't know how to do halves on the computer. Its actually called, "Spraddled legs". This happens when the goslings have retained too much water and are too heavy to support themselves after hatching, their legs splay out to the side. The cure, according to an old book on geese, is to hobble the legs with a double strand of soft wool around the ankles. It seems to be working for this one. Remedial swimming in warm water in the kitchen sink is also recommended. It takes the weight off the legs and strengthens the muscles. The Khaki Campbells hatched eight weeks ago and now spend all day grazing and searching for insects, slugs, snails and worms . If they had access to shallow water they would be eating small fish and amphibians. Ducks need water for foraging, feeding, drinking, swimming and preening. They need to be able to cover their heads with water to wash their eyes and bills and to shake it all over their bodies. Thats why they make such a mess if kept in small runs in gardens. Our domestic ducks (Khaki Campbells) are descend from wild Mallards and still behave in much the same way as their wild ancestors. They spend most of their active time exploring food sources and foraging as a group. All the time grunting and talking to each other. About 90% of the food they forage is grass which they don't digest very well so it passes through the gut very quickly.Its this foraging that makes them such efficient egg layers without much supplementation by grain and concentrate rations. So we need some more....there are six Cayuga eggs and six white Campbell eggs ready to go into the incubator this evening. Those of you who were paying attention back in November should have been expecting this today. Five months on and five days back from when the tups go in and you have your first lamb, usually. Today's pair were born in a freezing shower but to an experienced mother she had sheltered behind a rock on a bed of dry bracken. Can't be much fun being a sheep. Flukes are eating your liver, roundworms stealing your nutrients in your gut , ticks sucking your blood and then you give birth on a windswept hill. Twenty nine to go, over the next 21 days so that means several rounds of the hill each day starting at daybreak and finishing at dusk. No one ever complains about this lambing routine though, its full of surprises and satisfactions. I remember a time when Shepherds knew their sheep individually. As an aid to further identification if they strayed each flock had an ear mark, mine used to be the, "back bit of the near lug" in other words a triangular nick at the back edge of the left ear. Rural police forces held a record of all the flock marks in their area. However its 2012 and such methods won't do. In the interests of national security, bio security, traceability , manufacturers of plastic tags and I suspect bureaucrat's jobs; sheep now have to a have plastic electronic tag in one ear and a non-electronic flock tag in the other. Failure to do all this entails severe financial penalties. The hogg in the picture above may not look like a security risk, but you never know? Wherever it goes it can be traced by the yellow electronic tag in its left lug. The orange tag is the "Flock tag" with a unique number, the breeding sheep are double tagged. Enough of this or you'll lose the will to live. The system is so complex and I'm so simple I have to refer to the DEFRA four page, "Quick Guide to Sheep Identification" with its bullet points, flow charts and diagrams when tags are torn out on briars, fences and whins or the lambs get to 9 months. Could this be a pilot scheme for electronic tagging of UK subjects at birth?. There would have to be exceptions of course; those who are born to rule; future Eton scholars and Bullingdon Club members for example. This rant was brought on when I realised that one of my shearlings has lost both tags, we'll have to gather all the sheep, work out what the missing number is, replace the tags and record the replacement in the flock register. After 28 days in the incubator the Embden goose eggs that I didn't eat began to hatch on Thursday 5th. First a small hole appeared in the shell on day 27 then it gradually got larger until after about 36 hours with a final heave the gosling forced its way out. At 8.45 on Friday evening there were two in the box and another three in the process of hatching. The humidity in the incubator is kept very high (70% ) at this stage so that the membranes surrounding the emerging gosling don't dry, shrink and entrap it. To dry them off as quickly as possible after hatching I transfer them to a cardboard box on top of the stove where its much drier. Sunday morning and the goslings were dry and running about under the heat lamp. Three more weeks of heat and they can go outside. Last week was balmy, 20C plus. Then last night we had wind sleet, rain and snow; the worst possible weather for young lambs, they soon become hypothermic. After breakfast today Nan, a neighbour who has ewes in the field next to ours, arrived at the back door with a lifeless , cold lamb that couldn't hold its head up. It needed treatment and intensive care. We gave it a glucose injection then dried it off, wrapped it in a blanket with a hot water bottle and put it in front of the Rayburn.Next when it looked a bit stronger I put in a stomach tube and fed it some milk. It was still shivering, but had a 50/50 chance of surviving. It cetainly wouldn't have lasted long out in the field. He had 25ml glucose then two 50ml feeds of milk with the tube by 11.00am. As I had nothing better to do, it seems I'd been left to look after him for the rest of the morning. "Norfolk Boy" the psychopathic Ixworth cockerel has been reprieved. I had tartiflette and salad for lunch. Sue Cheadle, Crofter at Sanna is taking him along with a few of his wives to a high security twilight home for criminally insane poultry. Norfolk Boy is the one on the right with big claws, evil eye and cruel beak., He has got to be much heavier than Asterix the Gaul on the left. The camp younger brother of Asterix is "TinTin" and he has also gone into care with Joyce O Connor at Achosnich. This leaves me with only Asterix the elegant and friendly BG cockerel for the moment. Its a lot quieter at 4.30am. Wherever you are in the World there are three things people love to watch; a fire, running water and other people at work. 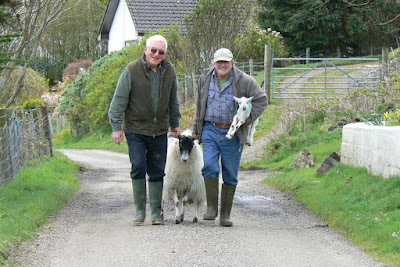 The old byre we are renovating is right on the roadside so we have also had free advice. In fact I gave a prize to the only person who didn’t tell me that the walls aren’t perpendicular. John Chaple, got a cabbage. The byre has stayed in the same place for, we think 90 years, in the face of N. Atlantic gales and gusts of over 200km/hr so a bit of flexibility is essential, like Damascus steel it bends but doesn’t break. Its only 50mm out of perpendicular. After the battens are on,where the boards join, it needs a coat of preservative and then a spray with bituminous paint (tar) for weatherproofing and black goes well with a dark green roof. It may also be possible to make it weasel, stoat, mink and pine marten proof if we concrete the edges of the base inside and cover the eaves ventilation with weldmesh. Its worth a try. Over the year the stone base has been eroded so we'll build it up and concrete it. Should be good for another 90 years. By using re-cycled roofing sheets, caravan windows* and locally grown and milled timber the work has been done for less than the cost after grant if we had used new roofing sheets. *The caravan was destroyed by time and weather many years ago only the aluminum windows and the steel chassis remain. This is the best type of caravan.